Samsung promises a more sociable experience with the launch of its WB850F digital compact camera, offering built-in Wi-Fi and GPS connectivity. Among the new range of Samsung cameras showcased at CES 2012, the WB850F is leading the way with an impressive array of connectivity features and high-end specs. Inbuilt Wi-Fi connectivity lets users either email their snaps or upload them directly to Facebook, Picasa and Photobucket, using the camera's Social Sharing feature. An on-screen keyboard also means pictures can be accompanied with personalised messages. 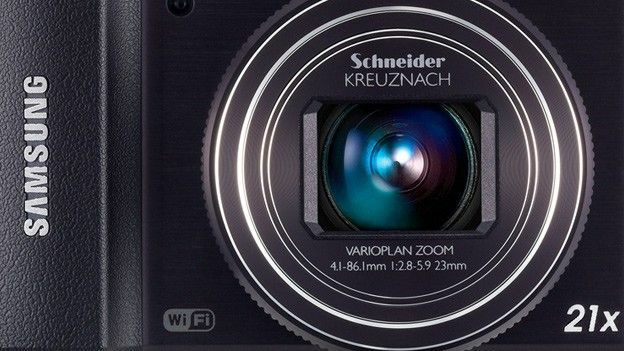 The camera itself comes packed with a f/2.8 lens and 16 megapixel CMOS sensor, useful for maintaining quality snaps in low-lighting conditions, as well as a 21x optical zoom. Additional GPS functionality means pictures can be geotagged, and users can even search for information about nearby locations using the camera's Live Landmark function. On top of that, the WB850F's SMART Wi-Fi feature provides a backup feature that lets users to upload their pictures onto Samsung's new AllShare cloud service. Has Samsung won you over with its Wi-Fi Smart camera? Is social photography the way forward? Let us know via the comment box below.